Birthed from Chicago street vendors during the Great Depression, the Chicago-style hot dog features an eclectic mix of tastes and textures. The creation was well received and cost a mere 5 cents. Keep reading to find out more about the Chicago-style hot dog. The Chicago-style hot dog is almost as fun to look at as it is to taste. The base ingredient, a beef hot dog, is placed into a warm poppy seed bun and then covered with colorful toppings. Yellow mustard, onions, tomatoes, relish, and spicy peppers come together to create a jubilee of different flavors, textures, and even temperatures. 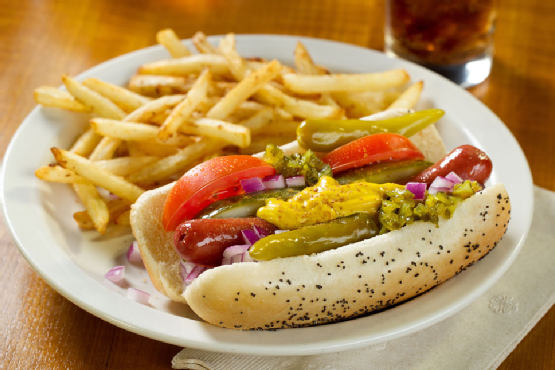 Finally, the Chicago-style hot dog is topped with a pickle spear and a pinch of celery salt. Pizz’a Chicago is proud to serve Palo Alto and San Jose with deep-dish pizza as well as corporate catering. Want to know more about our Chicago-style pizza? Feel free to give us a call at (408) 283-9400. Check out our website today to find out more about what we can do for you.